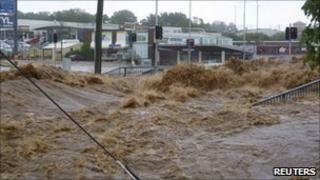 Image caption Flash floods in Australia were described as 'biblical' by a government official. The twin natural disasters that hit Australia early this year will cost its economy A$9bn ($9.4bn; £5.8bn), according to the Treasury department. The latest figure is a substantial increase on the earlier estimate of A$5.6bn. Treasurer Wayne Swan said the biggest impact will be felt by the country's resources and agriculture sectors. The Australian states of Queensland and Victoria were hit by floods and a cyclone in January and February. The biggest effect will be on the coal industry with output down by about a fifth. "Lost coal production could cost A$6bn, which is A$1bn more than previously estimated," Mr Swan said. "Damage to crops will be close to A$2bn, and the loss of activity to the tourism industry is expected to amount to A$400m," he added. Australia's economic boom has been powered largely by the success of its commodities sector. Increasing demand for its resources from emerging economies has sustained an expansion of the Australian economy in recent years. As the floods and cyclone hit Australia's resource rich states, the impact on the overall economy is likely to be significant. Mr Swan said the disasters will cut Australia's Gross Domestic Product by half a percentage point in the year through to 30 June. "No one was ever under any doubt that the financial toll of the devastation we've seen in Queensland and elsewhere in Australia this summer was going to be substantial," Mr Swan said. "The latest figures back that up and indicate the cost is likely to be even larger than initially thought," he added. The cost of natural disasters at home is not the only worry for the Australian economy. It is also likely to feel the pinch of the earthquake and tsunami that hit Japan on 11 March. Japan is Australia's second largest trading partner. Australia exported 15% of its goods to Japan in 2009-10. The biggest sectors are iron ore and coal, with Japan accounting for 27% of shipments of those commodities. The quake and tsunami have hit Japanese industry hard with production at some of Japan's biggest manufacturers being halted or suspended. As a result, demand for raw materials is likely to fall in the short to medium term. The treasury department said that this is likely to result in a loss of A$2bn ($2.07bn) worth of trade for Australia.